Cold temperatures and some much-needed spare time over the holidays provided the perfect opportunity to fire up the smokehouse and do some cold-smoking. We decided to do some pork chops and turned to our favorite smoking resource for a brine recipe: Charcuterie: The Craft of Salting, Smoking and Curing by Michael Ruhlman and Brian Polcyn. 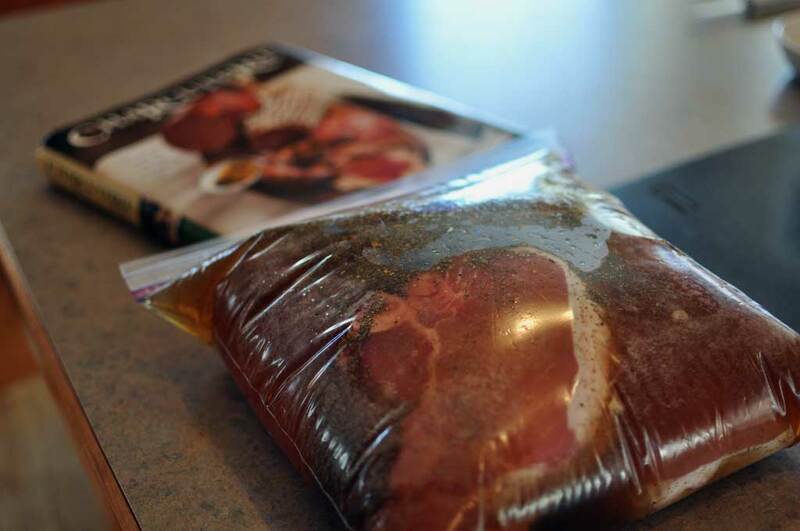 After mixing up the brine to dissolve all the ingredients, we placed 6 thick bone-in pork chops in a gallon Ziploc bag and put them in a cooler in the garage to soak overnight. 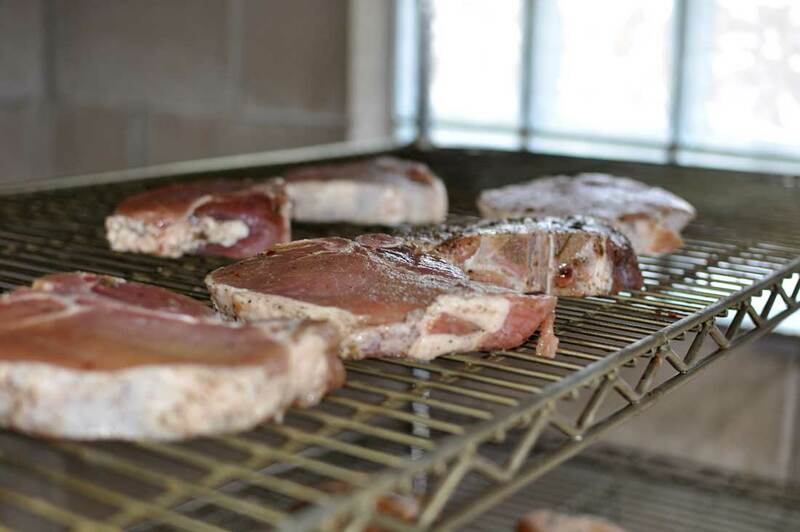 In the morning, we put the brined pork chops on the steel rack in the smokehouse and let them sit for a few hours to dry. Jesse eventually fired up the firebox and smoked the chops for about 5 hours with apple wood. The smell was mouth-watering. The chops were grilled on New Year’s Eve in 15 deg F weather. 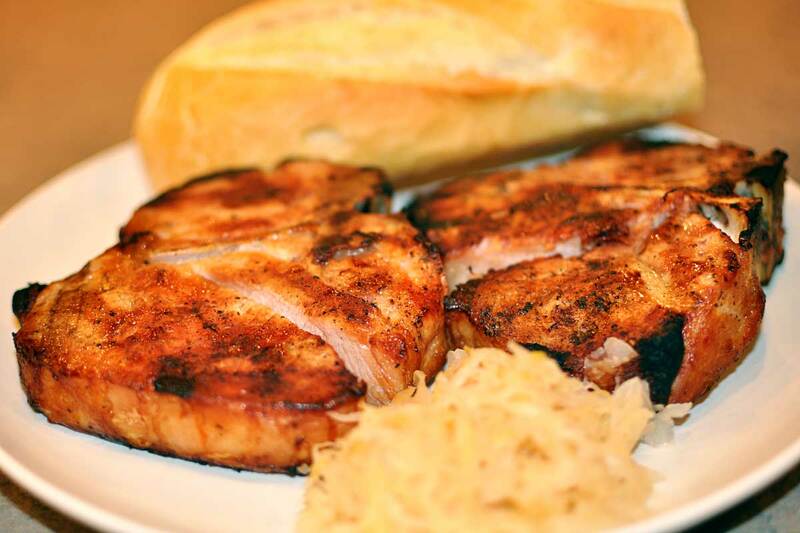 As usual with a finely cold-smoked meat product, the meat was pink all the way through the chop from the smoking, the brining kept the chops moist and flavorful, and a side dish of sauerkraut or applesauce were great complements. A cold Blue Moon beer was the finishing touch to a great meal. If only Jesse’s little brother would have sent us a nice hand-crafted box of chocolate truffles (www.intriguechocolates.com) for Christmas, the meal would have been perfect! As Rachel Ray would say YUMBO!…..save some leftovers for me, although I doubt there will be any…..love that smokehouse! Why was no cure with a sodium nitrite (6.25%) not used? Is it due to the ambient temperature of that day being below 40 degrees? As I understand it the main reason to use a cure with the above percentage of nitrite is to prevent botulism from forming during the cold smoke process. Could you explain you position for not using a cure with nitrite? Thanks. A couple of different factors go into the decision on whether or not to use sodium nitrite to prevent bacteria growth. The most important factor is the smoking temperature being well below the risk point of 70 deg F. Additional factors to consider are sanitary handling conditions, working with a whole cut versus ground meats (more susceptible), and final cooking temperatures that reach FDA guidelines for meats. If you are unsure about your ability to manage the risk factors associated with food borne bacteria, then adding nitrites can give you added security. Hope that answers your question! a quick question — how much nitrate do I add and do I use #1 or #2 pink salt. gracias. we are at 10,000 feet and i would feel a bit more comfortable with some nitrate. Feliz Navidad. Gracias. Sorry for the delayed response. For some reason I just saw your comment now. I’m sorry that I don’t know the answer to your question on nitrates. The recipe we used for these did not call for it and it isn’t something we have chosen to use in anything so far. I hope you were able to find an answer to your question via another resource! Thanks for stopping by.